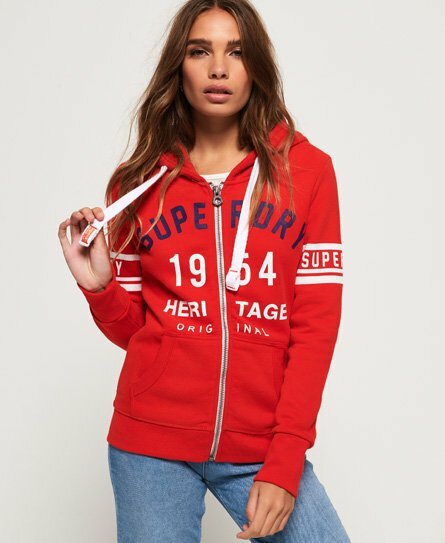 Superdry women’s 1954 Heritage zip hoodie. A must have in every woman’s wardrobe, featuring a draw cord adjustable hood, a large cracked Superdry logo across the front and ribbed hem and cuffs for a comfortable and flattering fit. This zip hoodie also has two front pockets as well as Superdry logo detailing on the sleeves in a cracked effect. For the finishing touches, this hoodie has a Superdry tab in one side seam and our signature orange stitching in the other.